Firefly: Lieutenant! Why weren't the original indictment papers placed in my portfolio? Roland: Why...eh...I didn't think those papers were important at this time, Your Excellency. Firefly: You didn't think they were important? Do you realize I had my desert wrapped in those papers? Here, take this bottle back and get two cents for it. Firefly: Chicolini! I betcha eight to one we find you guilty. Chicolini: At'sa no good, I can get ten to one at the barber shop. Prosecutor: Oh, you object! On what grounds? Firefly: (Bangs gavel) Objection sustained. Prosecutor: Your Excellency! You sustained the objection? Firefly: Sure, I couldn't think of anything else to say either! Why don't you object? Prosecutor: Chicolini...When were you born? Chicolini: I don't remember...I was just a little baby. Prosecutor: Isn't it true you tried to sell Freedonia's secret war code and plans? Chicolini: Sure! I sold a code and to paira plans! 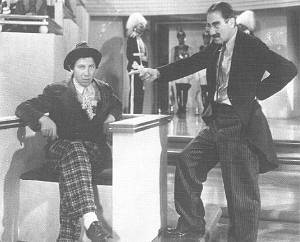 Heh, heh...(To Groucho) At's some joke, eh boss? Firefly: Now I'll betcha twenty to one we find you guilty! Prosecutor: Chicolini...Have you anyone here to defend you? Chicolini: It'sa no use. I even offered to pay as high as eighteen dollars, but I no coulda getta somebody to defend me. Firefly: (Pontificating) My friends...This case moves me deeply. Look at Chicolini...He sits there alone...An abject figure. Firefly: (Pontificating again) I say, look at Chicolini...He sits there alone...a pitiable object! Let's see you get outta that one...Surrounded by a sea of unfriendly faces...Chicolini! Give me a number from one to ten! Chicolini: Now I ask you one...What is it has a trunk but no key, weighs two thousand pounds, and lives in a circus? Chicolini: A relaphant? Hey! That's the answer...There's a whole lotta relephants in the circus. Judge: That sort of testimony we can eliminate! Chicolini: At'sa fine, I'll take some. Chicolini: A lemonade...A nice, cold glassa lemonade. (Aside to Firefly) Hey boss, I'm goin' good! Firefly: Gentlemen...Chicolini here may talk like an idiot, and look like an idiot, but don't let that fool you...He really is an idiot. I implore you! Send him back to his father and brothers, who are waiting for him with open arms in the penitentiary...I suggest that we give him ten years in Levenworth, or eleven years in Twelveworth! Chicolini: I'll tell you what I do...I'll take five and ten in Woolworth! Firefly: I wanted to get a writ of Habeas Corpus, but I should've gotten a-rid of you instead.